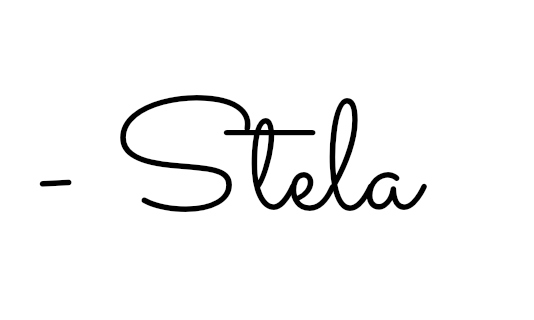 Stellar Makeup: SPRING & SUMMER NAIL POLISH FAVOURITES! SPRING & SUMMER NAIL POLISH FAVOURITES! 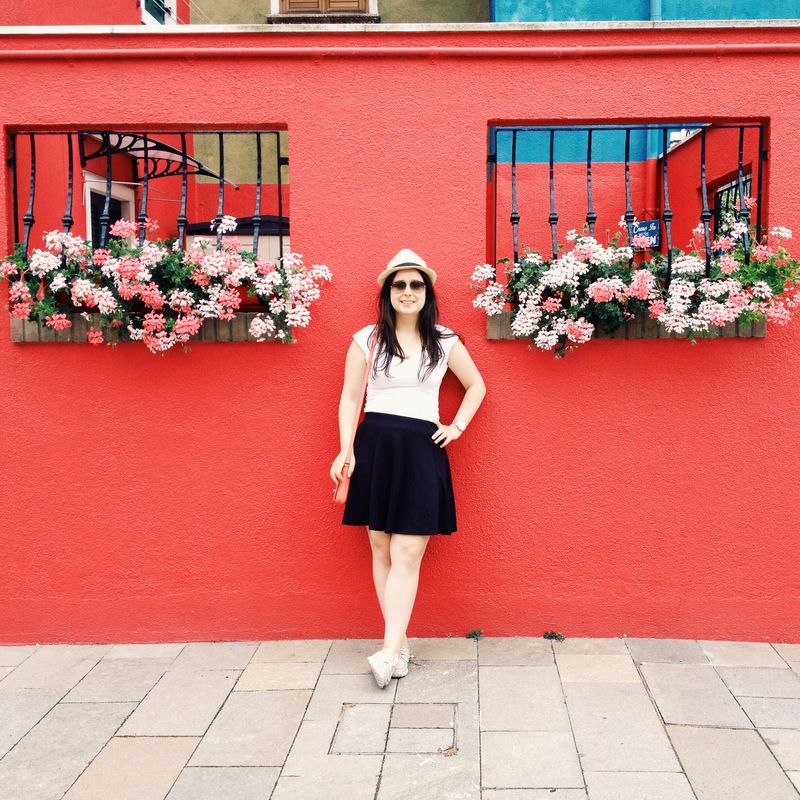 Spring time weather has finally made an appearance in Toronto and it's time to get back to bring out the spring wardrobe! I love spring and summer because I'm able to wear bright clothing plus pastel nail polish colours. As you will see, I love bright nail polish and I'm a huge fan of Essie. Here are my top spring and summer nail polishes that I'll be wearing on repeat the next few months! First up is Essie's Borrowed & Blue. This came out a couple years ago in one of the Essie's wedding collection but I think you can still buy this colour in store. It's a pale blue and leans on the white side. This is one of my favourite baby blue polishes I own and I always get excited to finally be able to wear it in the spring and summer. Applications is pretty good, two coats and the shade will be opaque. This shade is also a creme with no shimmer in it. 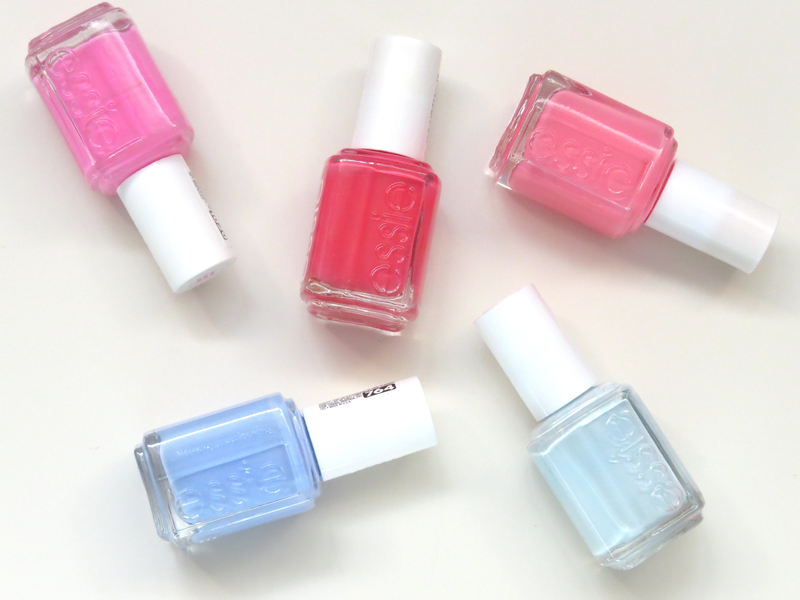 Sticking with the blues family, another favourite of mine for spring and summer is Essie's Bikini So Teeny. When this shade first came out I was so undecided on it. I'm happy to say that I'm very glad I finally purchased this shade as it has definitely become a favourite of mine. Bikini So Teeny is a periwinkle blue with silver glitter. I tend to not like shimmery nail polishes but the glitter is very fine and you can't notice it on the nails unless you're looking really close or are in direct sunlight. Full opacity will need about two to three coats. 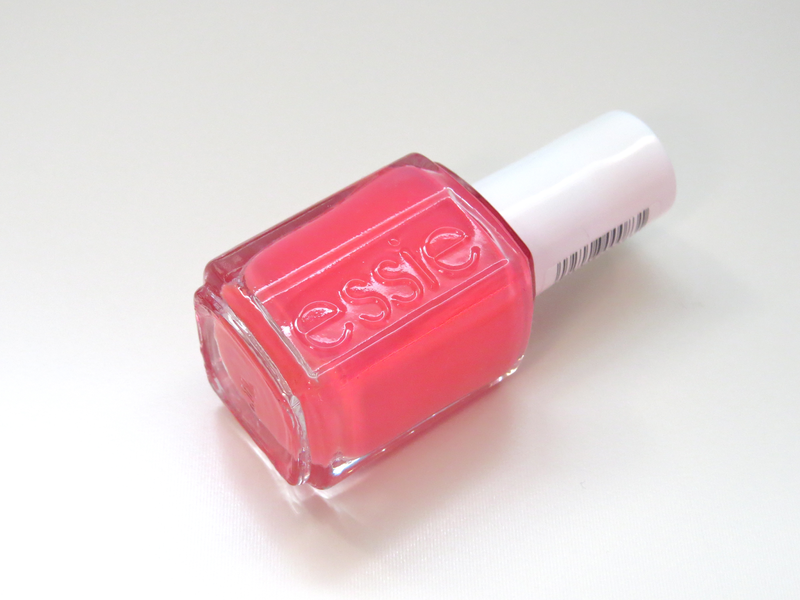 Next up is Essie's Knockout Pout, a medium warm toned pink. It dries very bright but you definitely will need to apply a topcoat as it driest matte. Application can get a bit streaky but three coats will give you full opacity. This shades is one of my ultimate favourites from Essie. I tend to always gravitate towards this shade in the summer and I love wearing this on my toes. This is Essie's Cute as a Button, a medium pink/coral. Application can be a bit better but with two to three coats you can get the colour to look as it does in the bottle. Last but not least is Essie's Boom Boom Room. The best way to describe this shade is "barbie pink." I love wearing this shade on my toes in the summer as it's super bright. Two coats and you're good to go! Also done a more in depth review of this shade here! These are the five nail polishes that I know I'll be using repeatedly this summer! What are some of your favourite nail polishes?